Want to know who will win? Welcome to crix11.com. In Today’s Dream11 Fantasy Cricket Prediction RCB vs KKR 29th T20 Match IPL 2018 we will cover match preview, expected playing 11, dream11 best team, pitch report of M.Chinnaswamy Stadium, Bengaluru, astrology forecast on the toss. We will also cover players recent and past performance, weather report of Bengaluru, dream11 guru prediction, latest news and updates of Royal Challengers Bangalore vs Kolkata Knight Riders, key players, the best choice for captain and vice-captain, where to watch the live match of KKR vs RCB and details of live streaming. If you want to get 100% benefit then make sure to read the post till the end. All the details in this post are absolutely FREE. To win any fantasy league, you should have an idea about the teams and their stats. We provide you all the details. Just analyze the data and make your own team. Where Can You Watch the Live Streaming of RCB vs KKR or Channels to Watch? Who Will Win the 29th Match of IPL 2018 Between RCB vs KKR and Toss Prediction? What is the best combination of players for Dream11 in 29th Match? Date: The match will be played on 29th April 2018 (Sunday). 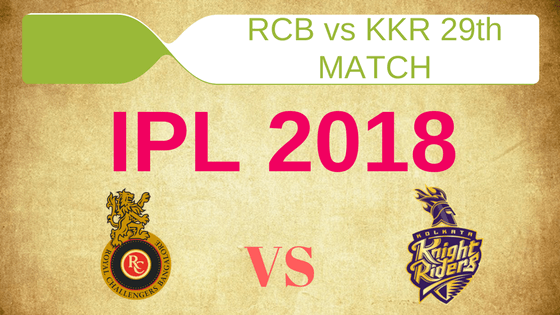 Match: Indian Premier League, KKR vs RCB, IPL 2018. In this 11th edition of IPL, four matches were played on this venue and two games had 200+ runs and the other two were below 200. M. Chinnaswamy stadium has two pitches, one pitch favours the bowlers and the other one supports the batsmen. If we look at the previous matches this match will be played on the pitch which may favour the bowlers. In today’s match bowlers may get some help from the pitch but as the ground is small the batsman will have a huge advantage. The spinners will get a turn from this pitch. Today in Bengaluru, it is expected to be partly cloudy in afternoon and mostly cloudy in evening. Although there is no sign of rain, so cricket fans can enjoy the full game. The temperature is expected to be 29-Degree Celsius and humidity to be 39% which may go up to 67%. In last five matches, KKR won 4 games out of 5 games whereas RCB has won only one game. If we look at overall encounters, Kolkata Knight Riders won 12 times and Royal Challengers Bangalore won nine times. In M.Chinnaswamy Stadium, both the teams have equal win percentage. Star Sports has paid a huge amount of INR 16,347.50 Crores to get exclusive rights of IPL 2018 for live coverage for five years starting from 2018 to 2022. Star Sports has all the media rights including TV and all Digital Rights. You can watch the full match of Royal Challengers Bangalore vs Kolkata Knight Riders on Star Sports. Virat Kohli (c), Mandeep Singh, Quinton de Kock (wk), Washington Sundar, AB de Villiers, Colin de Grandhomme, Moeen Ali, Corey Anderson, Yuzvendra Chahal, Pawan Negi, Pavan Deshpande, Umesh Yadav, Navdeep Saini, Mohammed Siraj, Aniket Choudhary, Manan Vohra, Brendon McCullum, Kulwant Khejroliya, Aniruddha Joshi, Chris Woakes, Tim Southee, Murugan Ashwin, Sarfaraz Khan, Parthiv Patel. Chris Lynn, Dinesh Karthik (c & wk), Shubman Gill, Sunil Narine, Andre Russell, Robin Uthappa, Mitchell Johnson, Nitish Rana, Tom Curran, Shivam Mavi, Cameron Delport, Kuldeep Yadav, Ishank Jaggi, Rinku Singh, Piyush Chawla, Javon Searles, Vinay Kumar, Prasidh Krishna, Apoorv Wankhade. RCB must fix their bowling issues if they want to win today’s match. On the other hand, KKR is a balanced team but they lost their last match against Delhi Daredevils. Royal Challengers Bangalore is at the bottom of the points table and Kolkata Knight Riders are in the middle of the table. Both the teams will be desperate to win this match. For RCB, today’s match will be a do-or-die match. Kohli will be desperate to win this match and for this, he may make some changes in their bowling department. RCB may think of bringing Moeen Ali and Tim Southee. AB de Villiers, Quinton de Kock, Yuzvendra Chahal, Virat Kohli, Corey Anderson/Tim Southee, Washington Sundar, Mandeep Singh, Colin de Grandhomme/Moeen Ali, Mohammad Siraj, Umesh Yadav, Kulwant Khejroliya. KKR may think of changing their seamers like Shivam Mavi and Mitchell Johnson as the conceded 100+ runs against Delhi Daredevils in the previous game. They may give chance to Prasidh Krishna and Tom Curran. Sunil Narine, Dinesh Karthik (c, wk), Chris Lynn, Robin Uthappa, Shivam Mavi/Prasidh Krishna, Nitish Rana, Piyush Chawla, Andre Russell, Mitchell Johnson/Tom Curran/Cameron Delport, Shubman Gill, Kuldeep Yadav. Pro tips: Both the players are good. Make a combination of the above players for multiple teams. Pro tips: The above players are most likely to perform in today’s match. Make a combination of the above players for multiple teams. Pro tips: The above players are safe to keep in your team. If you can take a risk then you can also keep players from playing 11 lists. Make a combination of the players from the above list. Pro tips: Make a combination of players from the above list. Pro tips: The above players are most likely to perform today. You can take them as a captain and vice-captain. Pro tips: You can keep the above players as a captain and vice-captain. Both the teams will be desperate to win today’s match as neither of the teams has performed well in this IPL. If we look at today’s match prediction, RCB will win the match. Our Astrology team says that Virat Kohli will score big today as the stars are favouring him. The team winning the toss will decide to bowl first and if you go by our astrology prediction, KKR will win the toss and they will invite RCB to bat first. Although this decision will benefit Royal Challengers Bangalore. If you want to win the grand league, then try to keep big hitters in your team. Players like Virat Kohli, AB de Villiers, Chris Lynn Andre Russell are the must. You can also keep Tim Southee as he gets a chance to play in today’s match. Conclusion: This is it for Today’s Dream11 Fantasy Cricket Match Prediction of RCB vs KKR, 29th T20 Match, IPL 2018 which will be played on Sunday 29th April. You can give your valuable feedback in the comment section. Subscribe to our notification of latest updates. GOODBYE!